London, phone cameras at the ready we give you the epic Bagelizza! 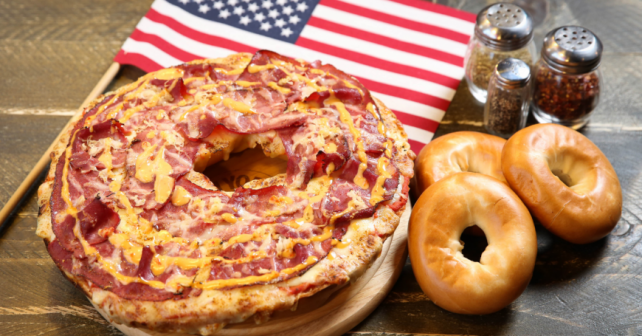 As the name suggests, it’s part-bagel, part-pizza monster mash-up and it’s launching on Saturday at Mulberry Street Pizza – timed to coincide with National Bagel Day AND National Pizza Day; both of which fall on the same day. It’s a big beast and, even better, your dreams have been answered as they’re FREE this weekend in a big nosh for nothing launch. Staff at their Notting Hill branch will be serving up dozens of gratis portions so get there from 12pm sharp to ensure you get your hands on one. Did we mention it’s massive? Really, it is. The 1.5kg (!!) 12-inch deep dish can feed about eight hungry mouths so take your mates and go hungry. Toppings are a combo of brisket, sauerkraut, Swiss cheese, signature sauce and a mega 300g of melted mozzarella.